We’d love your help. Let us know what’s wrong with this preview of Murder at Netherfield by Jann Rowland. After the ball at Netherfield, a fault in their carriage results in the Bennet family being forced to stay at the Bingley estate, and when a blizzard blows in overnight, the Bennets find themselves stranded there. Lady Catherine de Bourgh, having heard of her nephew's interest in the second Bennet daughter, descends upon them, demanding her nephew marry her daughter, makin After the ball at Netherfield, a fault in their carriage results in the Bennet family being forced to stay at the Bingley estate, and when a blizzard blows in overnight, the Bennets find themselves stranded there. Lady Catherine de Bourgh, having heard of her nephew's interest in the second Bennet daughter, descends upon them, demanding her nephew marry her daughter, making all who are trapped at the estate uncomfortable by her behavior. 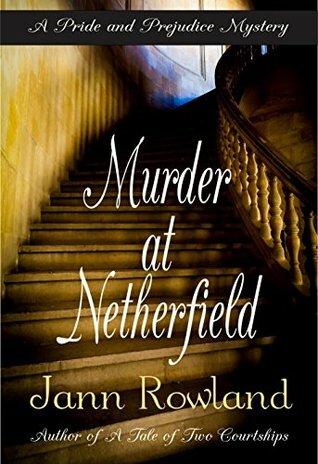 To ask other readers questions about Murder at Netherfield, please sign up. This is a P&P Mystery with MURDER in case that wasn't obvious from the title. Over all the story is quite good and the murderer isn't instantly revealed. I literally can't say much more with out spoilers. In this Pride and Prejudice variation, the Bingley family, the Bennet family + Mr Collins, Darcy, Colonel Fitzwilliam, Wickham, Lady Catherine, and Anne are all stuck in Netherfield after the ball due to a once in a lifetime snow storm. All the personalities are stuck as though in a pressure cooker with lots of outbursts and then people start dying (no spoiler since it is the title of the book). Fear and doubt cause some interesting confrontation and conversations. True colors are revealed to ev In this Pride and Prejudice variation, the Bingley family, the Bennet family + Mr Collins, Darcy, Colonel Fitzwilliam, Wickham, Lady Catherine, and Anne are all stuck in Netherfield after the ball due to a once in a lifetime snow storm. All the personalities are stuck as though in a pressure cooker with lots of outbursts and then people start dying (no spoiler since it is the title of the book). Fear and doubt cause some interesting confrontation and conversations. True colors are revealed to everyone's satisfaction. Seventeen people (plus numerous servants) trapped by severe snow in an isolated country house. Seventeen people (plus numerous servants) waiting out the storm … and then there was one person fewer. The countdown begins. Shades of “Ten Little Indians” – minus the table centerpiece and the poetry (which is not the food of love, after all)! After the Netherfield Ball, the Bennet family and Mr. Collins are forced to remain Mr. Bingley’s guests because of a problem with their carriage. Lady Catherine has arrived, intent on stopping Darcy’s betrothal to the obstinate, headstrong girl. Anne de Bourgh has been dragged along. Wickham appears at the door and must also be allowed to stay. With Caroline Bingley already living at Netherfield, all of our favorite villains are present. The murderer drops a clue after the first death pointing to a possibility of mistaken identity! As the deaths count up, they seem unrelated. Are all the deaths even murder? What do these victims have in common? That is the mystery. How to identify the murderer? That is the problem. Darcy and Fitzwilliam set out to investigate, aided by Elizabeth Bennet. As Jack Webb used to say – just the facts, Ma’am. Who will Mrs. Bennet blame? What motive could encompass all the murders? What steps must the inhabitants take to protect themselves? And how can a lifelong love develop in the middle of a murder scene? I loved this book, it kept me on the edge of my seat trying to figure out who was the culprit. Another great story by Jann Rowland, thanks. I would give this 4.5 stars. It is a very good mystery, with good plot points. It took me awhile to figure out the killer. The romance of Darcy and Elizabeth was written well. I enjoyed this book a lot and even though I know the ending, I will be reading this again. I enjoyed the mystery and the setting of the events. The characters were well written and the plot was good. I was satisfied, that I figured out the identity of the murderer. It was nice to read, how about the investigation, and how fumbling in their attempts Darcy and Lizzy were. Only colonel Fitzwilliam had some investigative experience and contributed to discovery of important clues. Wickham's character was captured to perfection. There were some inconsistencies and it moved a bit slow at time I enjoyed the mystery and the setting of the events. The characters were well written and the plot was good. I was satisfied, that I figured out the identity of the murderer. It was nice to read, how about the investigation, and how fumbling in their attempts Darcy and Lizzy were. Only colonel Fitzwilliam had some investigative experience and contributed to discovery of important clues. Wickham's character was captured to perfection. There were some inconsistencies and it moved a bit slow at times, but in all a very satisfying read. In spite of a few problems I had with this story, which were mostly minor (I spent too long in a job that required me to edit and proofread), I loved this mystery. It's definitely a mystery, as well as a romantic Pride and Prejudice variation, and the mystery puzzle is well crafted, so much so that I didn't figure out who the killer was until just before the main characters did, and even so I didn't feel that any critical details had been withheld from the reader. So in that regard it's a brilli In spite of a few problems I had with this story, which were mostly minor (I spent too long in a job that required me to edit and proofread), I loved this mystery. It's definitely a mystery, as well as a romantic Pride and Prejudice variation, and the mystery puzzle is well crafted, so much so that I didn't figure out who the killer was until just before the main characters did, and even so I didn't feel that any critical details had been withheld from the reader. So in that regard it's a brilliant mystery, and that is not an easy thing for writers to do. The story begins with the arrival of Mr. Bingley at Netherfield, and all the excitement that causes for local mothers hoping to achieve good marriages for their daughters, including of course Mrs. Bennet. She and her two oldest daughters are introduced to Mr. Bingley at the Meryton Assembly, and in this variation, after Mr. Bingley asks Jane to dance, Mr. Darcy, at the urging of his friend, asks Elizabeth for a dance. At first, seeing that he's only asking because his friend wants him to, she almost refuses. It's already clear that Mr. Darcy is not overly friendly. They barely talk during the dance, though she learns Darcy is only visiting Netherfield to advise his friend, who hopes after this lease is up to purchase an estate of his own. They don't speak again, after that dance, and Elizabeth is left unimpressed, though she later learns that Jane is quite taken with Mr. Bingley. Things continue on in this vein through October and half of November, with the Bennets and Bingleys and Darcy meeting up at several social functions, and Elizabeth begins to find Mr. Darcy an interesting man as she attempts to sketch his character. Darcy finds himself more and more drawn to her. Finally Mr. Bingley plans a ball and sends out invitations. It's around this time that the Bennets are surprised by a visit from their distant cousin, Mr. Collins. He has come to have a look at his future estate, acting almost as if it's already his. He almost immediately latches onto Elizabeth as his future wife, and when he sees her conversing with Darcy, he's clearly not happy about it. He finagles an invitation for himself to the Netherfield ball, and secures the first dances, in advance, with Elizabeth, making it impossible for her to refuse. He does this right in front of Darcy. The night of the ball, Elizabeth feels obliged to dance first with Mr. Collins. But later she dances with Mr. Darcy. It's then that George Wickham appears. Bingley had sent a blanket invitation to the militia officers. Wickham asks Elizabeth to dance, mainly because he's just seen her with Darcy. He tells her his tale of woe about Darcy cheating him out of his living, but Elizabeth isn't inclined to believe such a confidence from a man she's only just met, and she has seen how angry Darcy is that Wickham is here. Then Lady Catherine arrives at the ball, having been bidden to Netherfield by Mr. Collins, who informed her of Mr. Darcy seeming to set his sights on Elizabeth Bennet. She brings her daughter Anne with her, and is ready to force Darcy's hand with her daughter by humiliating both him and Elizabeth publicly and telling everyone that he's engaged to Anne. She insists on meeting Elizabeth. Then a snowstorm hits, just as the last of the other guests are leaving, and the Bennets' carriage is late returning to fetch them, because of a mechanical failure. The snowstorm is quickly blowing into a blizzard, and the Bennets are forced to spend the night in the same house with Lady Catherine, her daughter, Mr. Bingley, his sisters and brother-in-law, Mr. Darcy, and -- we later learn -- Mr. Wickham. The next morning the butler, Mr. Forbes, is found dead, having apparently fallen down the stairs while making his nightly rounds. It's assumed to be an accident, until one of the guests is also found dead a couple of mornings later, and the party soon realizes they have a murderer in their midst. Mr. Rowland has done it again! I really enjoy this author 's writing. He's not afraid to be a little dark and sinister with his material, even while telling a love story. Nothing too frightening, but definitely not a light and fluffy romance. The teaming of Darcy and Elizabeth in an informal murder investigation fit well with their individual personalities, being curious, clever and intelligent. The circumstances leading to the presence of so many of the characters from P&P at Netherfield for Mr. Rowland has done it again! I really enjoy this author 's writing. He's not afraid to be a little dark and sinister with his material, even while telling a love story. Nothing too frightening, but definitely not a light and fluffy romance. The teaming of Darcy and Elizabeth in an informal murder investigation fit well with their individual personalities, being curious, clever and intelligent. The circumstances leading to the presence of so many of the characters from P&P at Netherfield for this particular occasion was well done and only a little contrived. I got through most of the book without a clue as to "whodunit"! As an ardent supporter of this author, I could not put this book down until I had finished it. The villains met their ends in a 😢 manner. To think that Mr. Bennett was the actual target was surprising. Elizabeth and Darcy worked hard to find the truth. If course Elizabeth encountered the murder first. The problem with this one is that most of the story was just tedious. I skimmed almost the entire book. I have read and enjoyed many of this author's other variations but this one fell short. Really enjoyed this mystery variation of P&P. Didn’t realize until close to the end who the murderer was. Thank you for an enjoyable read! An interesting take on pride and prejudice with plenty of murder to keep you wondering. A good read and easy to follow. Jann Rowland is a Canadian, born and bred. Other than a two-year span in which he lived in Japan, he has been a resident of the Great White North his entire life, though he professes to still hate the winters. Though Jann did not start writing until his mid-twenties, writing has grown from a hobby to an all-consuming passion. His interests as a child were almost exclusively centered on the exotic f Jann Rowland is a Canadian, born and bred. Other than a two-year span in which he lived in Japan, he has been a resident of the Great White North his entire life, though he professes to still hate the winters. Though Jann did not start writing until his mid-twenties, writing has grown from a hobby to an all-consuming passion. His interests as a child were almost exclusively centered on the exotic fantasy worlds of Tolkien and Eddings, among a host of others. As an adult, his interests have grown to include historical fiction and romance, with a particular focus on the works of Jane Austen. When Jann is not writing, he enjoys rooting for his favorite sports teams. He is also a master musician (in his own mind) who enjoys playing piano and singing as well as moonlighting as the choir director in his church’s congregation. Jann lives in Alberta with his wife of more than twenty years, two grown sons, and one young daughter. He is convinced that whatever hair he has left will be entirely gone by the time his little girl hits her teenage years. Sadly, though he has told his daughter repeatedly that she is not allowed to grow up, she continues to ignore him.